This undated image provided by The Kroger Co. shows an autonomous vehicle called the R1. 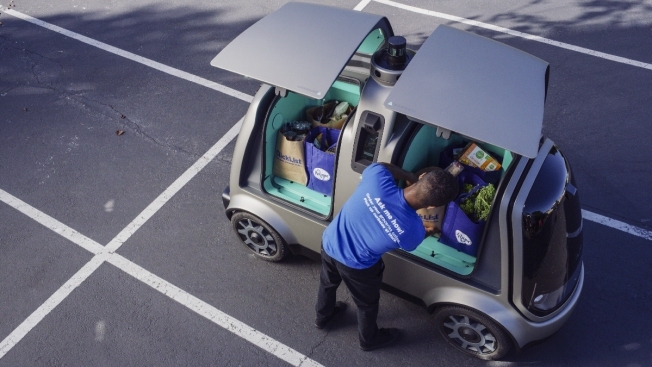 Kroger will begin testing grocery deliveries using driverless cars outside of Phoenix. The grocery chain said the project will begin Thursday, Aug. 16, 2018, in Scottsdale, at a Fry's supermarket, which is owned by Kroger. The Toyota Prius will be used for the deliveries, manned by a human to monitor its performance. During phase two in the fall deliveries will be made by the R1 with no human aboard.